Posted far from home and faced with death and injury, the Roman soldier had good reason for fear. Religion served to instill the men with confidence and discipline. The religious activities of the army were linked with those in civilian life. Festivals, ceremonies, official cult monuments, and oaths made the soldiers feel at home in the military. The ceremonies were strategically planned to coincide with travel and war. The Roman army often cleared the outside borders of their camps not only for protection from surprise attacks, but because this sacred area was set side for the gods. Roman religion had great propaganda value. When new lands were conquered the Romans often erected monuments to show that the land was now under Roman control. The institution of Roman religion in new provinces can be viewed as a method of "Romanizing" conquered peoples. The battle standards of the legions were venerated in a religious way. The legionary standard with the most symbolic importance was the aquila, "eagle." In the Empire a cult of the emperor developed. This manifested itself in the imagio, a standard topped with a golden representation of the ruling emperor's face. An incident in Judea highlights this standards religious value. The procurater of Judea, Pontius Pilot, began his term in office by bringing in some standards to be housed in Jerusalem. Among them were imagio of Emperor Tiberius. The outraged Jewish populace protested, demanding the removal of these graven images. They insisted on their demand despite the Romans' threat of violence (Josephus, The Jewish War II, 165). The success and prosperity of a unit was seen as linked to the standards. Every Roman camp or fort had a shrine to house the staqndards. To lose a standard was a tremendous dishonor. The army would do everything within its power to regain it. Recovered standards were not returned to the legion. They were instead placed in a temple constructed by Augustus devoted to Mars Ultor, "Mars the Avenger." Every Roman soldier pledged allegiance in a sacred oath, known as the Sacramentum. This pledge maintained the idea that a position in the Roman military was of sacred importance. Unfortunately, no complete text of the oath has been preserved, probably due to each legion's own individual version of the Sacramentum. The oath was recited on enlistment, on the third of January, the anniversary of the current emperor's reign. In the Republic the soldiers pledged their loyalty to their commander. In the Empire the emperor received the pledge. This change was enacted under Augustus. At the center of Roman military camp or fort was a shrine, known as the aedes. This housed the standards and the treasury of the unit. In the center of the shrine were the aquila and imagio, which were encircled by the standards of each cohort. The shrine was given precedence over all other structures. Other buildings were made of wood, this important building was made of stone. The shrine also served as a meeting place for troops and as the center of religious worship, this is due in part to the soldiers' worship of the contents of the shrine. Jupiter, the god of light and sky, was the supreme god of the Roman pantheon. The army worshipped him especially as Jupiter Optimus Maximus, which means "all-good and all-powerful." His temple was the most important sanctuary in Rome and was also the center of political life. At this Temple wars were declared and the Roman army came to give thanks. The eagle was often considered his messenger, hence the impotance of the eagle as a military standard. Eagle wings and lighteningbolts, both symbols of Jupiter, featured prominently on Roman shield blazons and other miliary equipment. The presence of an actual eagle in the sky could serve as an omen of defeat or as a sign of victory. Mars was one of the most worshipped gods in the Roman military. The soldiers sought his protection in battle and credited his power with the Empire's expansion. Mars was the son of Jupiter and Juno, and was thought to be the father of Romulus and Remus, the mythical founders of Rome. Many temples were erected in his honor. The Temple of Mars Gradivus was particularly important to the Roman army. This was where the army gathered before they went to war. Sacrifices and prayers to Mars were held there to ensure a Roman victory. The Campus Martius, "field of Mars", which was situated beyond the city walls of Rome, was also dedicated to him. Here the Roman army was drilled for battle. In the Regia on the Forum Romanum, the hastae Martiae (lances of Mars) were kept. When these lances were moved it was interpreted as a portent of war. The warlord was to lead the army in to battle while saying "Mars vigilia! ", which meant "Mars awaken!". These actions and words were intended to make Mars awake and lead them to victory. Several festivals were held in honor of Mars: The Armilustrium, which was held on October 19, was very important to the Roman Army. During this festival the weapons of the soldiers were ritually purified and then stored for the winter. Minerva was the goddess of wisdom, medicine, science, and war. The daughter of Jupiter, she was often considered the patroness of the Roman army. This cult was directly associated with the creation of weapons with iron. This cult was popular among the legions because of the soldiers strong assosiations with the metal. Juppiter Dolichenus is said to have originated from the sky, while others said he came from the place where iron was born. This cult had its greatest popularity in the early third century. Soldiers did not think the cult was properly established until a sanctuary was built. As a result, a sanctuary to Juppiter Dolichenus was erected in 191 AD in Rome. Cults from conquered provinces were often incorporated into the military religious structure. These new cults were often avery specific to particular units of the military. For example, when Rome expanded into Syria a cult was imported and became exclusively affiliated with the archers. In the mid second century AD the eastern gods, Serapis and Isis, were very popular, and they had an altar dedicated to them by the Roman army. Egyptian gods were very popular. Ancient Egyptian dieties and pharaohs were made into Roman gods. Originally based on the eastern frontier, Legio XV Apollinaris introduced the cult of Mithraism to the Roman west after transfered to the Danube in the third century AD. It became an important cult, especially popular with the officers. 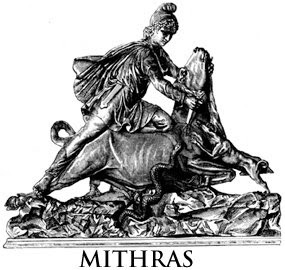 The myth stated that "Lord of Light," Mithras, killed a bull, spilling its blood to release human creativity. Several aspects of the cult were attractive to soldiers. It was a religion only open to men. It had a special trainig periods, initiantion rites and a rigid rank structure, all similar to the army. One of its core beliefs was that of an afterlife. Esentially a religion of peace and forgiveness, Christianity had received little interest from the army types until well after it was made the Empire's offical religion.